Mother’s Day was definitely something I was looking forward to. 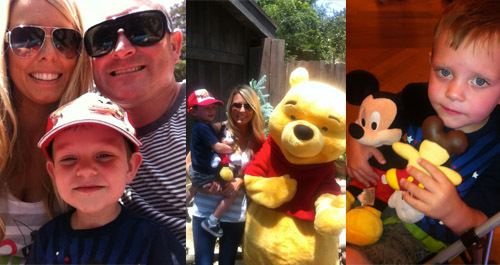 We decided to spend a day at Blakey’s favorite place–Disneyland. (Surprised? I know. We are becoming regulars… Good thing is, I’m trying to fill-in-the-blanks for those days..or um..years I skipped adding things to the blog…way before Mickey Mouse was in the picture.) Anyway, here are a few shots of us enjoying another fun day. This time I was treated to a new “Tink” shirt and a yummy cookie in the shape of Mic himself (that thing B is holding that resembles a character minus the eyes). His pants were tasty. Exhausted at 2pm, we decided to leave and stop by the place where Mike’s Mom is buried. It’s always a bittersweet day for us. She encompassed everything I want to be for Blake: patient, sweet, and always there for her child–no matter what. 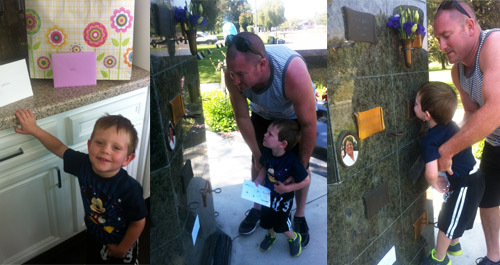 Blakey brought tears to our eyes when he rolled up his hand painted card, put it in her flower holder, and gave her a kiss. In true form though, he then started kissing everyone’s plaque. Mike said, “Oh I’m sure Grandma Jeanne’s neighbors sure like those kisses!” He’s such a love. M + B, thanks for a very special day. I’m so thankful to be a mom.